As a child, my fascination included so many things....one of which was the reversible fabric. I often wondered how difficult and creative a task it was to weave a fabric that can be used on both sides. One such fabric was the DAMASK. In simple words....Damask is a reversible figured fabric of silk, wool, linen, cotton, or synthetic fibers, with a pattern formed by weaving. It derives its name from its supposed origin, the city of Damascus, Syria. Damask weaves are commonly produced today in monochromatic (single-colour) weaves in silk, linen or linen-type synthetic fabrics which feature patterns of flowers, fruit, and other designs. Damask weaves are most commonly found in table linens, but are also used for clothing and furnishings. I specially love to use damask motifs in floral designs and would like to see them in all possible options that I can think of. Some of them are as follows. 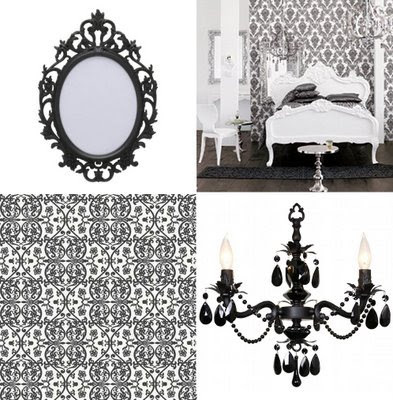 Use stencils in Damask to create beautiful feature walls. 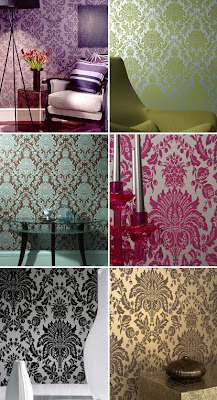 If you find stenciling tedious, simply opt for a textured wall paper in damask motifs. You can also create frames of art using different damask fabrics. This would become a fabric wall mural in damask motifs. Try your hand at creating an interesting art piece using the damask motifs and acrylics using some stencils. Make stencils of your own with simple damask motifs. Interesting metal sofa in a damask motif backrest adds subtle elegance to an otherwise ordinary sofa. 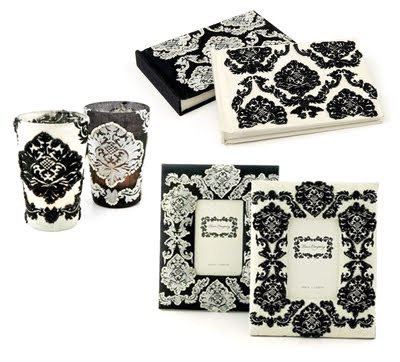 Stencil out or decoupage damask motifs on candle holders, picture frames to achieve a true damask look to your scheme Fancy bath accessories are now available in damask patterns at various outlets. The traditional damask fabric is in now and are available at many outlets in a variety of colours. Using a simple damask motif wallpaper, a damask patterened mirror frame and a damask shaped ceiling fixture adds elegance and beauty to simple interiors. Try matching the valance of your bed in a damask fabric to create a subtle interest and a touch of elegance. Ask your carpenter to etch out simple damask motifs on left over wood pieces....join them together to create an art piece. 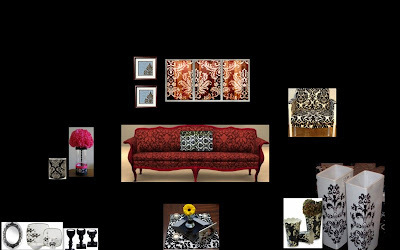 Here is a simple moodboard showing damask motifs used on different mediums to create a harmonius scheme. Lovely! I sooooooo want that sofa!! Great pictures you have put up. Beautiful post Vasudha. Congrats on being featured in Blog adda's Spicy Sat picks! Wish you would have put up some stencils so that I can could try them at home :) Do let me know if you have any!